The NFL has to be one of the toughest sports betting markets out there. Due to the popularity of football betting, oddsmakers leave little wiggle room in their opening odds and any errors are quickly snatched up by sharps and syndicates, leaving valueless scraps for the public bettors come Sunday. Losing Andrew Luck was crushing for this franchise in 2017 but the Colts are holding out hope that their star quarterback will return and be the same passer he was before suffering a severe shoulder injury, needing surgery, and then going through numerous setbacks. Even with Luck on the sideline, Indianapolis was completive most weeks – despite ranking 30th on offense and 31st on defense. Those two stats cloud just how close the Colts were to more wins in 2017. Indianapolis was just 4-12 SU but went 8-8 ATS, and improved on defense towards the end of the season. If Luck can return, the Colts are set up for potential ATS winners early on. After opening at home versus Cincinnati as a 1-point favorite, Indy plays at Washington (3-point dog) and Philadelphia (10-point dog), then hosts Houston (3-point home dog) before visiting New England (10.5-point road underdog) in Week 5. Books have thrown a ton of points at the Colts in those latter four games, and the public will likely push those spreads even higher by game day, opening up value on this undervalued side. The pecking order in the NFC North is shifting. Minnesota is now at the top, and the Green Bay Packers could be primed for a tumble. That leaves room for improvement from the Bears, who finished the 2017 season with an 8-7-1 ATS record, including a 5-2-1 mark against the spread at home. Chicago has a great defense, which ranked 10th in the league last year despite the offense being a mess and giving them little time to rest between series. The success of the Bears – either in the standings or at the sportsbook – hinges on the progression of second-year quarterback Mitch Trubisky, who showed flashes of potential during his rookie campaign. Chicago dropped head coach John Fox and grabbed former Chiefs offensive coordinator Matt Nagy, who should really help this offense find its footing. Chicago opens the schedule at Green Bay as an 8.5-point dog, then is a pick’em at home to Seattle, a 1-point dog at Arizona, and a 2.5-point fave hosting Tampa Bay. It was a bad year for Broncos backers in 2017. 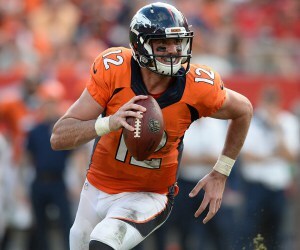 Denver finished dead last in the AFC West, and broke the bank with a 4-11-1 ATS mark. That 5-11 SU record still happened despite the third-best defense in the NFL, which allowed only 201 yards passing per game. All the blame was on the offense, which gets a shot in the arm – maybe? – with the addition of former Vikings comeback kid Case Keenum. He managed a steady offensive attack for Minnesota, which – like Denver – thrived on defense. Keenum has Demaryius Thomas, Emmanuel Sanders, and rookie WR Courtland Sutton as targets, while the Broncos’ rushing corps will likely be ball-carrier by committee. However, running backs have always flourished in the Mile High City. The Broncos face the shell of the Seahawks as 2-point home chalk in Week 1, then host the Raiders as 1-point faves, visit Baltimore at +5.5, and come back home for a Monday night matchup with Kansas City as 1-point favorites in Week 4.